"My colleagues, every statement I make today is backed up by sources, solid sources. These are not assertions. What we're giving you are facts and conclusions based on solid intelligence... Indeed, the facts and Iraq's behaviour show that Saddam Hussein and his regime are concealing their efforts to produce more weapons of mass destruction... Leaving Saddam Hussein in possession of weapons of mass destruction for a few more months or years is not an option. Not in a post-September 11th world." Regardless, the Dividist is delighted with Powell's endorsement. This endorsement means we can take the same post we wrote four years ago, and run it again with only minor edits. Powell was a frequent subject of posts on this blog. He is a man I respected in the Bush41 administration, and would have wholeheartedly supported for President in 2000. If we had used the Powell Doctrine as a guiding principle in 2003 as we did in the first Gulf War, we never would have gone down the disastrous Neocon path in Iraq. "In 1995, Robert McNamara (widely referred to as "the architect of the Vietnam War") writing in his memoir "In Retrospect: The Tragedy and Lessons of Vietnam", revealed that as early as 1967 (with 25,000 American dead) he no longer believed that America could win the war in Vietnam, and as a direct consequence of expressing that view, resigned (or was fired) from the LBJ administration.... Neither McNamara nor LBJ chose to share that insight with the American public. Ultimately it took 50,000 American lives for a majority of Americans to learn that their government could not be trusted on the reasons for, nor the "light at the end of the tunnel" progress in, Vietnam. It is reasonable to posit, that if McNamara had recognized in 1968 that his loyalty was owed first to the American people, and second to the LBJ administration, had communicated what he knew then to the American people, we might have seen a better end, a quicker end, and fewer deaths and casualties in Vietnam... Colin Powell enabled the GWB administration to garner the support needed to put us on this course. I suspect that Colin Powell, out of misplaced loyalty, like McNamara on Vietnam, failed to be forthright and honest with the American people about Iraq. Should Colin Powell, in future memoirs, like McNamara, proclaim that he knew that the Iraq occupation was a wrong policy, he will, like McNamara, have blood on his hands for every day that passes between the time that he recognized the mistake, and the day he finally comes clean with the American people. It took McNamara 27 years. How long will it take Powell?" If Powell understood that invading Iraq was the wrong path, Powell should have told Bush that he did not support the policy and resigned. Colin Powell enabled George W Bush to make the decision to prosecute the occupation of Iraq. Colin Powell sold the war to the American people. After Cheney and Bush, Powell is the man most responsible for the Iraq war decision. At some level Powell knows this. He is a study in contradictions. As a consequence of failing to act on what he knew to be right in 2002/03, he has spent years explaining and justifying his actions. I cannot help but feel that this endorsement of Obama is an attempt to assuage his conscience, rehabilitate his reputation and scrub the blood off his hands. 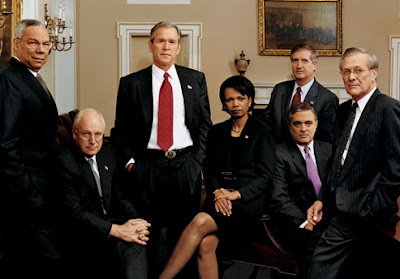 Gone to court to defend every Bush/Cheney assertion about indefinite detention of enemy combatants. Exercised executive war making authority without congressional approval that far exceeds anything that occurred or was attempted during the Bush/Cheney years. Vastly expanded the range and scope of government surveillance on United States citizens beyond anything that was permitted during the Bush/Cheney administration. Asserted and acted on Executive authority to maintain a kill list, and to order the assassination of enemies of the state at the sole discretion of the President. 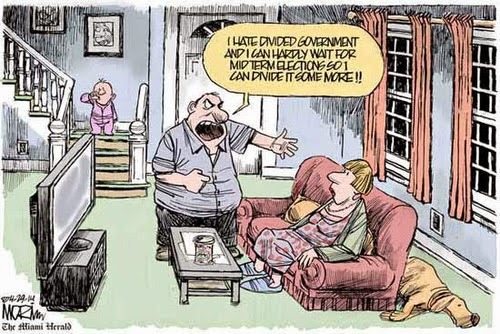 Even American citizens. Seen in that light, the neocon apologist Colin Powell endorsing Barack Obama makes perfect sense. Except that I am used to it and have come to expect it. 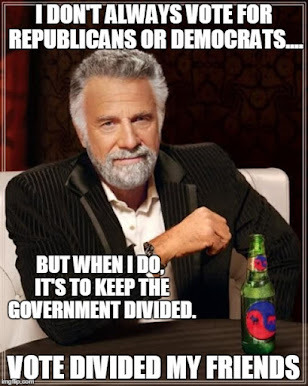 In a way, the entire divided government voting heuristic is based on continuous "Flounder moments" from both major parties regardless of who is in power. In fact, I believe it was James Madison who said in Federalist #51"C'mon you Flounders! Trust anyone with government power and you are f***ing up! That's why we need checks, balances, separate, equal, and divided branches of government."